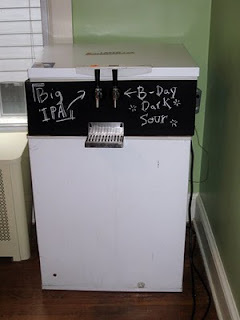 Back in September I put together my first kegerator, and I've got to admit that I am now a convert to kegging. I've enjoyed being able to force carbonate beer, fill any size glass (or just have a taste), and it really is much quicker/easier than bottling. However, I hadn't found a good way of letting my friends know what beers I have on tap (besides just telling them and pointing). I had considered getting a small chalkboard or white board to put on the wall next to it (as many homebrewers do), but that didn't seem like enough fun for me. After using a can of chalkboard spray paint to refinish an old chalkboard that my girlfriend bought from someone on Craigslist, I had the answer to my dilemma. So I took the collar off the kegerator and sprayed the front with two coats of the paint an hour apart. After 24 hours the surface was ready for me to chalk the names of the two beers on tap. It is functional, and I think it looks pretty cool/unique. The new labels came in very handy for my housewarming/birthday party over the weekend. I still had plenty of my "Pound of Hops" IPA on tap, but I kicked the keg of Hoppy Saison a week back. It seemed like a waste to have a two tap system with only one keg, but I didn't have any other batches ready to drink. So I decided to blend some bottles of homebrewed beer to make a special dark sour cuvée. After some small scale tests I settled on a six pack each of my Sour Squash (big acidity, not much funk) and Big Funky (strong, some oxidized dark fruit, no carbonation), and one 750 ml bottle of my Adam clone to add some richness and a hint of peat. The blend was a big hit at the party, combining the best aspects of the three beers to yield a sour, but balanced beer with lots of dark fruit complexities. 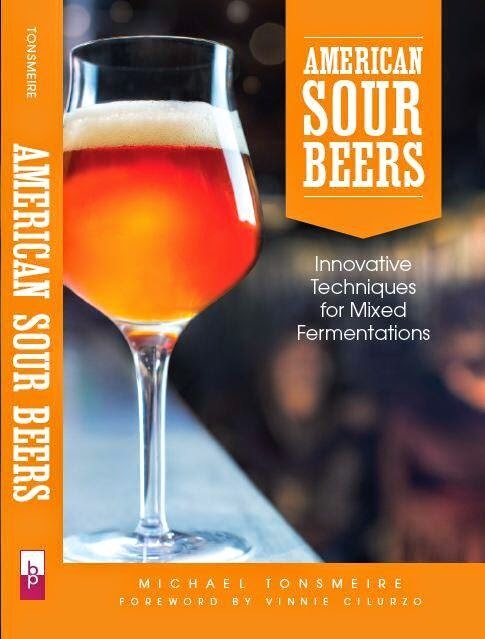 I've seen you mention filling kegs from bottle(s) before to carbonate - how do you go about doing that? Seems like a giant pain/mess to rack each individual bottle - what equipment are you using? Chalkboard looks great! And your blend sounds tasty! I just purged the keg with CO2 and poured the beers in. Since CO2 is heavier than air it should hang around in the keg long enough to protect the beer. I wasn't too worried if a little oxygen did get in there since the beer only had to last a couple days, and being dark/sour should provide some protection. May not be glamorous, but it sure was easy. Love the kegerator. Really great idea. I have to say I'm really enthused by the step up in the # of posts you've had lately. I don't know anyone else that's posting like you are, and usually a cool topic like this. Glad people are enjoying this post and the greater number of posts in general. I've been trying to post smaller things like this even if they aren't as in-depth as some of my other posts. So I'm interested in getting into kegging, but I haven't found a kit for under $150. You might want to get a kit without a CO2 tank though and just get a CO2 tank from a local place that will just swap empty for full with you though.